When I was creating this blog, I was quite certain that book musings would play a regular if not leading role in what I shared. After all, reading is like oxygen to my lungs; the beauty of the written word may begin in my mind, but soon travels throughout my soul injecting moments with new meaning, depth, and perspective. Besides this, I buy books as though my life depended on it. Maybe this is because I think it does. But for all that, book musing has not shown itself strong in my blogging these past two years. While I often reference a book I’ve read or am reading, I don’t generally review the books I’ve read, and I have never shared my “___________ Reading List” (summer…new year…hibernating in winter…). Not only have I not blogged much about what I’m reading or what I’ve read, I realize now that I have purposefully shied away from it. That seems silly, doesn’t it? But, you see, the books one chooses to read reveals more than just one’s surface interests. It is an open invitation into the soul. At least, it is this way with me. If I share with you my reading list, you would see that I’m a dreamer, an idealist, and–as much as I shun the notion–a romantic. I try to pretend I am a pragmatist. But my bookshelves betray me: poetry, essays, creative non-fiction, biographies, literary fiction, and the classics. Not only would my bookshelves prove I am a romantic, they would reveal I am a scholar-in-waiting, trying not to regret a degree in Special Education (very practical for a Midwestern farm girl) over pursuing my creative passions in writing, music, or art (and as a minor, theology or history), wondering how in the world with five children (read: five college tuition bills) I can ever hope to grace the great halls of higher learning again. 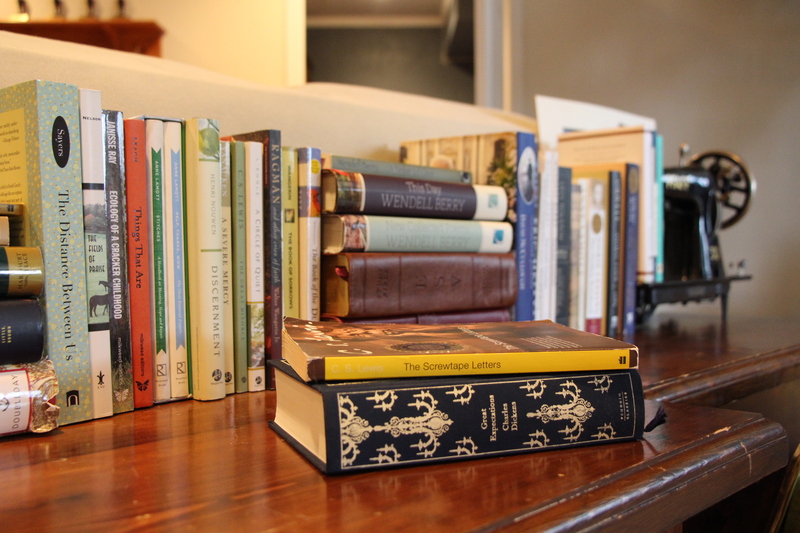 If you browsed my bookshelves, you would likely find an interesting read and ask me what I thought of it. Then I’d have to admit I haven’t read that book yet…nor have I read the three flanking it on either side. Actually, I would confess with cheeks burning hot, the shelf you’re browsing is one of several rows of books awaiting my attention. Then we would have an embarrassing conversation (for me) about my book-buying fetish—how I love browsing books in bookstores and online almost as much as I love reading them. And when I find one (or several) I just hate to pass up…well…I don’t. Why, you may ask, don’t I just check books out of the library? I would tell you how I write in all my books—even fiction books. This is true, but if one of my older children was within earshot, he would then rat me out, and tell about the time we were banned from the library because I owed so much in library fines if I even showed my face in the parking lot the library-fine police were alerted and ready to arrest me within minutes of arrival (a clear exaggeration, but still—it was a large fine). Maybe more than any reason for not sharing my thoughts on the books I’ve read, is my fear of constructing a poorly-written review. I deeply respect this style of writing. To formulate a well-thought, well-written review of a book is to handle both the content and its creator with kid gloves, while still being honest and true to one’s own interpretation of the muse. Literature is soul-food; created in the soul of one, feeding the soul of another. To take the examination of it with an air of lightness, self-indulgence, or—worst of all—pious judgment, is an abhorrence not just to the author and his or her creation, but to the entire literary community. In 2014, however, I’ve decided to try. I’m ready to risk the funny comments, awkward questions, and even more awkwardly written review prose so that we can share in the holiness of breathing literature together. 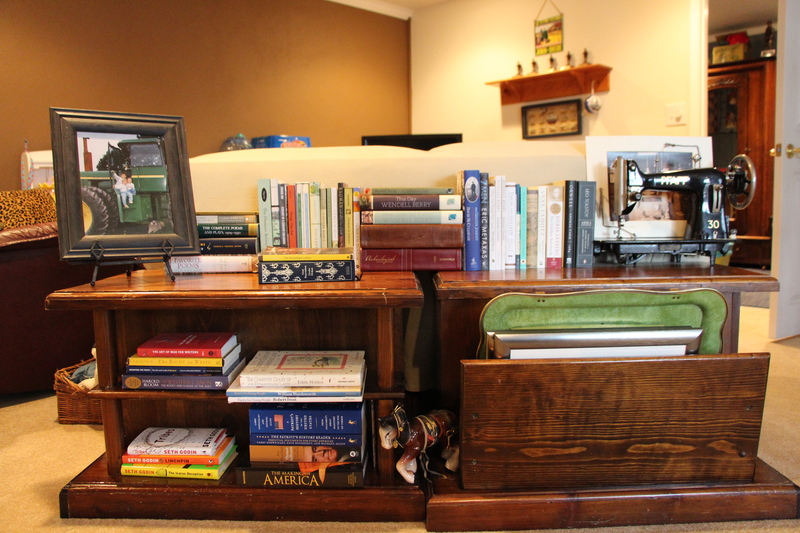 The picture at the top of today’s post is the space I created and the books I pulled to be my 2014 reads. I don’t actually expect to get through all of these, and some of them (the poetry at the end, the Study Bibles in the middle) are there for easy access or reference. I have chosen some fiction, some non-fiction, and a couple re-reads (something I never do, but always mean to). My desire is to pluck away at my pile, unfolding their beautiful effect on me. 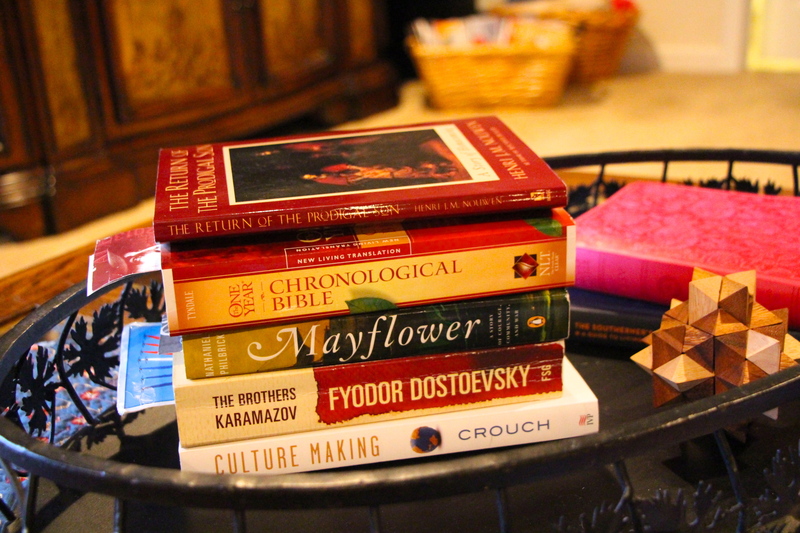 I do so hope that along the way, you will pick up a book or two and share in the holiness with me. Maybe we can be idealists and romantics together. So, with all this in mind…happy weekend reading! I love your remarks, here 🙂 I’m so glad I’m not alone. I’m sure you noticed I’m reading Brothers Karamozov now–I can only read a few chapters at a time before I have to put it down and digest all I just read–so much depth. 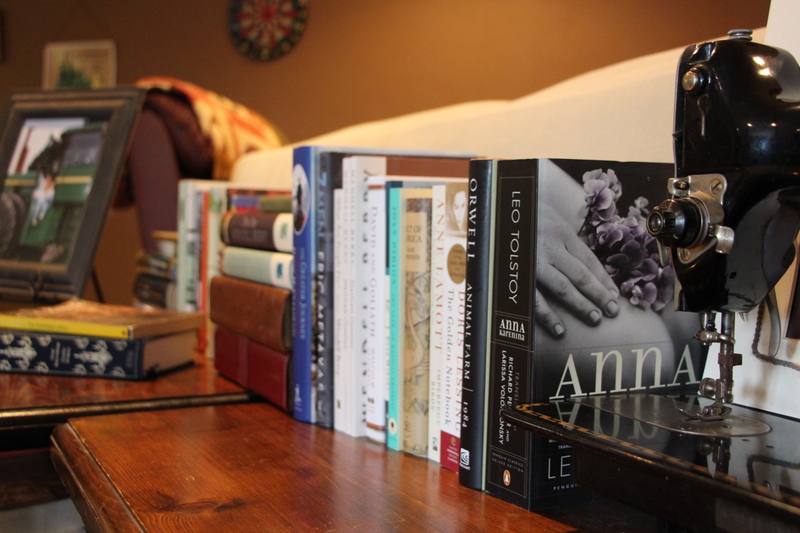 Anna Karenina is on my 2014 shelf as well. I read Crime and Punishment a couple years ago and so much of it continues to roll around in my mind today! I love that you have found my blog and that we can share life through our blogging and love of literature! Lorri–I just love, LOVE that you come visit my blog!! If you only knew how often during one of my son’s classes, I’ve wanted to just stop everything so we could chat about literature 😀 Happy reading, my friend!